Did your father ever tell you that you HAD to go somewhere and it was really the LAST place on earth you'd ever want to go? And did you finally realize you had NO other choice but to GO? Did you obey cheerfully or did you try to make life miserable for your dad? Sometimes God asks us to go someplace we'd really rather NOT. Don't you think it's best to obey Him CHEERFULLY and just go DO what He wants? "But I don't WANT to!" Esther exclaimed loudly. "You MUST, Esther. It is required of every girl over fourteen in the kingdom to enter," her cousin Mordecai explained. Esther's parents had died when she was young and he had taken her for his own daughter. Esther crossed her arms and said, "I don't want to be a queen. I'm happy right where I am. There are tons of other girls entering the beauty contest anyways. I won't matter." "You HAVE to enter, Esther, and THAT is FINAL. Besides, you don't know that you will be picked. There are many other girls entering. You are one among many. You MUST go," Mordecai said. "It is the King's orders." Esther stomped across the room and began clearing the table. "I'll go, but I WON'T like it." Mordecai sighed. "Esther, you must not act like that. You have to be cheerful. I want you to do your best. If not for the King, for me. Please?" The girl smiled over at the man. "All right, Mordecai. I will go, and I will go cheerfully." Mordecai smiled gratefully. "Thank you. Now get to bed. You have to leave in the morning, and you need rest." Esther gave her cousin a hug. "Good night." He hugged her back and said, "Good night, Esther." As Esther began to leave the room, Mordecai called to her and said, "Esther, wait. There is one thing more." Esther paused and said, "Yes?" "You must not let ANYONE know that you are a Jew. Do you understand?" She nodded in response. "Yes, I understand. Good night." "Good night," he said, as she left. When Esther was in bed under the blankets, she began to think about what was to happen. It seemed a little scary that she would spend an entire year in the palace, just getting ready to see the King. Yet, in a way, it was exciting. But what if she was chosen to be the King's new queen? Esther shivered. That wouldn't happen, WOULD IT? When the next day came, Esther woke up extra early and packed her things quickly. She wasn't too scared of leaving home. After all, her cousin would visit her every day for he worked at the palace as a minor official. After breakfast, Esther walked outside and sat under a willow tree nearby, waiting for Mordecai to come. The sun shone brightly down around the long branches and Esther could smell blossoms in the air. Soon Mordecai came out of the house and joined her under the tree. "You have been thinking hard, Esther," he said smiling at her. "I can see it in your face." Esther nodded. "I hope I'm not chosen to be the Queen." "Oh, Esther! I know you are scared of such a big job. You must not pray for what YOU want, but for what GOD wants of you." Esther looked confused. Mordecai sighed. "What I mean is," he began slowly, "you can't ask for what you want all the time, because it might not be what God wants. So you must ask for what GOD wants." "But I don't KNOW what God wants," Esther said, standing to her feet. "So," Mordecai said, "you pray, 'God, I want whatever you want.' Do you understand?" "I think...does that mean, instead of saying, 'God, please don't let the King choose me for his queen,' I am to say, 'God, if you want me to be Queen, then I will be happy with your decision'?" Esther asked timidly. Mordecai sat against the tree. "Yes, I think you understand." He stood and said, "Come, let us go to the King's palace now." The year seemed to go by very, very slowly for Esther. She, of course, was always on her best behavior but didn't like all the beauty treatments she and the other girls were given. Esther had been placed in the care of a man called Hegai, who was to give the girls the things they needed during the year. Esther became friends with him, and he favored her, bringing special things for her and her seven servants. 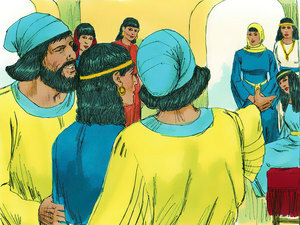 Hegai also placed Esther and her servants in the best room in the palace. As the days and months passed, Mordecai did as he promised and visited Esther every day to see how she was doing. The long process of purifications, oils, perfumes, and other things, was beginning to bore her, but Esther kept her promise as well and acted cheerfully in everything she did. Twelve months passed and it was time for Esther to go see the King. As Hegai led the beautiful girl through the gardens to the King's palace, servants stopped to stare at her beauty. It was quite the same inside the King's palace as well, and everyone seemed to like Esther. "Esther, do not be afraid of the King," Hegai said to her as they continued down a decorated hallway. "He may be the most powerful man in all of Persia, but he does not bite," he chuckled. Esther smiled at the comment and pulled at the long red gown she was wearing. "Do I look all right?" she asked timidly. Hegai smiled and said, "Just fine." When they had reached the throne room, Esther took a deep breath and shut her eyes. This was scarier than she had imagined it to be. She walked to the end of the room where King Xerxes sat and knelt before him. "Dear God," she prayed silently, "let Your will be done. If I am to be this man's Queen, so be it." Think of a time when your mom or dad asked you to go somewhere you HATED to go. Did you really give your mom and dad a terrible hassle? Did you have to go ANYWAY? Isn't it best to obey CHEERFULLY and go where you're told? Does it honor God when we disobey? Give Satan an inch and he will become your ruler. "Thou shalt therefore obey the voice of the LORD thy God"
Dear God, help me to obey cheerfully. Teach me to trust You. Help me understand that You know what's best for me. Copyright © 2018 by Barbara Wilmerton Haas. Royalty Collection: A King, a Queen & a Very Blue Berry! The Story of Esther - Listen now! Last updated June 4, 2018.